When J set up our wireless router, enabling me to get web service anywhere in the house, including lying in bed (which, of course, I am not doing at this minute, no sir), I was delighted. Now, I thought, I can continue to mindlessly surf work even once the kids are at home and Maya tosses me off the computer to do her school work, or when I’m minding Boo in the bath or – the possibilities were endless. The kids had different ideas. The moment they realized the laptop was now accessing the internet, they decided its primary purpose must be to play game with each other on Club Penguin. No, no and a thousand times no, I told them. I believe it took me a whole 4 hours to cave. It did seem kind of appealing. The first time we tried it, Maya was out. Asher logged Boo on downstairs and himself on in my room. It isn’t that simple, though, because there are a number of different servers and you have to log onto the same one. Plus, even though chatting is allowed, Boo can’t read that well and Asher didn’t have the patience to type. He preferred to run upstairs to tell me something, then run back down to help Boo. (He tried to convince me to bring the laptop downstairs, but I insisted that would make it no fun. I have a very comfortable bed.) So up and down the boy ran, getting more exercise than he’s had in weeks. We finally settled on playing hide and seek. Even though there is a whole town to hide in, it is actually very easy to find someone who is your buddy, because all you have to do is pull up your list of buddies and click on one. It then says, “Theo2467 is in the pizza parlour.” Asher’s solution was to move around so fast I couldn’t keep up. Not so exciting. But later that evening, Maya and I played and we’d actually find a place to hide, like behind a snowbank. Maya was more fun, since she could chat. I’d hide behind the snow fort and when she’d show up, I’d jump out and cyberyell, “BOO!” We also played a couple games of connect 4. I won. It was hard for my old mind to take in, that I was playing a really basic game with my kid, only she was downstairs and I was upstairs. The hide and seek was the best, though, because the real version bores me silly. Does it count as quality time with your kid, if you both have useless wings and one is purple and the other pink? Me: Okay, time for bed. Log off. Her: I don’t want to. And off she logged. Counting to three even works in cyberspace. I finally cracked and snapped, “If you’d just be quiet and leave me alone for a few minutes, I’d be finished a lot faster!” Which hurt his sensitive feelings and, valiantly holding back tears, he trudged out of my room. I felt so guilty I quit writing and game him the damn laptop. Victory was his. I have a deep New Year’s post waiting to go up, but it is on the laptop, and I am not, so I have decided to slide straight into the trivial for my return post. Webkinz is so passe, don’tcha know? 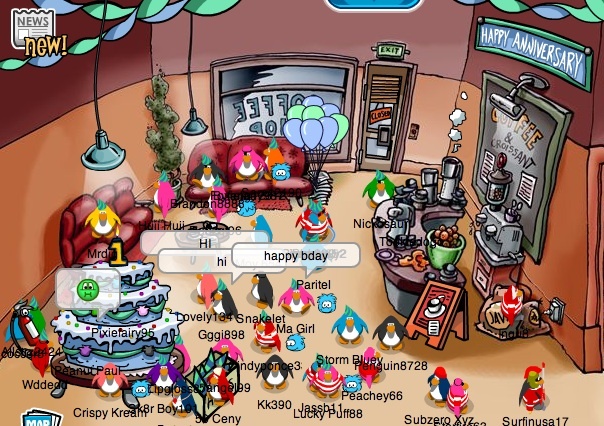 My kids have moved onto obsessing over Club Penguin, which is smart enough to let a kid be a member for free, only without being able to do any of the cool stuff. For that, you need a membership. After much negotiating, I agreed that Maya and Asher could each buy a month, in hopes that they’ll lose interest in that time and not beg for more (oh look! a slippery slope! why, it seems to be getting closer!). Of course, Boo was outraged. It is so unfair, she mopped, that they get memberships and she doesn’t, just because they are older and have their own money. I put her off for a bit, but then realized that putting up with all the moaning and begging wasn’t worth the $6 membership fee for a month. And I did see her point. We delightedly logged her on, as she announced her intention to buy a yellow puffle (a little tribble-like pet), just as her siblings did. Oh, how she yearned for that yellow puffle. I checked her account. She had $138. I asked Asher how much a puffle costs. A mere $800, he informed me. At this point, I had two choices. I could have Boo sit at the computer for about 4 hours, playing little games that make Penguin money until she had enough (money, or patience), or I could play the games for her and get it done much faster. Most of the games on Club Penguin are beyond her computer abilities. And this was how I found myself on Club Penguin yesterday afternoon, playing Connect Four with some child somewhere else in the world (actually, the skill involved in one of the games had me suspecting I was playing another adult). I also went fishing, played a version of space invaders and a maze game involving melting ice. 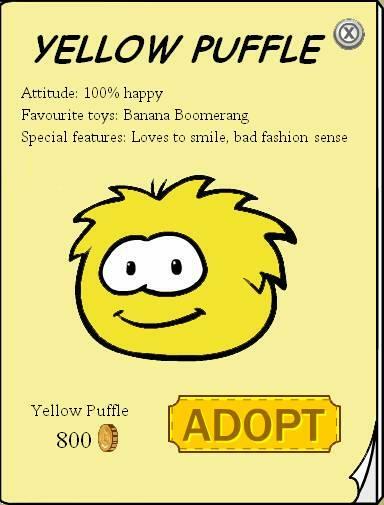 Boo and I are now the proud owners of a cute yellow puffle named Puffle.